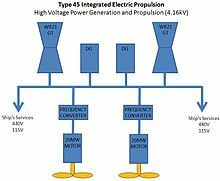 The successful commissioning of Type 45 Destroyers not only marked a significant landmark in the evolution of Naval Power & Propulsion systems but also proved to the world that Integrated Electrical Propulsion (IEP) is the future of World Navies. The fact that IEP is the chosen mode of propulsion for the prestigious DDG100 Destroyers program of US Navy and the Queen Elizabeth Class (CVF) Aircraft Carrier program of Royal Navy underlines the significance of this technology in warship building. Electrical Propulsion with military specific advantages such as tactical endurance, increased stealth, increased redundancy and survivability, is definitely going to be an essential feature of naval capabilities and the key to naval transformation. Mechanical Vs. Electrical Propulsion : In the case of Mechanical propulsion there are two sets of engines of which one is exclusively used for propulsion and the other is for generating electrical power for the electrically operated systems onboard. The high rpm of propulsion engine is converted to low rpm using a set of gears connected through a mechanical drive system. In the case of Electrical propulsion there is a single set of engines connected to alternators to generate the electrical power which is used to run the heavy duty propulsion motors connected through Variable Speed Drives (VSDs) as well as to feed the electrically operated systems onboard. Increased Stealth: Stealth is the most important aspect of any warship. It has been proved that the sound signature of the IEP vessels are considerably lower than that of the mechanically driven vessels. This reduces the warships overall acoustic detectability which is very critical especially for the submarines and thereby increase their survivability and effectiveness. The reduction in the overall volume of the electrically propelled surface ships reduces their IR signatures and Radar cross section. Reduced Life-Cycle Cost: It is estimated that an IEP warship will consume 10% to 25% less fuel than a similar ship with mechanical propulsion system. This would result in reduced life-cycle cost over the life of the vessel which normally is around 30 years. In addition to the savings on fuel, the IEP will also reduce the life-cycle cost as it would require less crew to man the vessel and as the maintenance requirement for the IEP is considerably lesser than the requirements of a conventional propulsion system. Increased Survivability: By eliminating the requirement to fit all the equipments required for propulsion in a straight line along the bottom of the ship and permitting them to be placed in locations which can be better protected, the IEP improves the survivability of the warship to a great extent. The use of Electric Drive makes it possible to distribute the equipments around the ship and thus preventing a total failure of the propulsion system due to a single hit. The IEP also offers more flexibility in utilization of the available power during emergencies when more power would be required for operating damage control equipments or for preventing an imminent threat. Flexibility for Power Utilization: The integrated electrical power system gives the flexibility to choose how to distribute the total energy available onboard to meet the propulsion, pay load and sensor load for various tactical situations. As the power required for propulsion can be controlled at any point of time, ships with IEP gives the advantage of fitting state of art and highly potent combat systems which would require large amount of electrical power for their operation. Increased Payload: As the Electrically Propelled vessel is more fuel efficient, the requirement of space onboard for storage of fuel will be less compared to the conventional vessels. The elimination of shaft line and reduction gears would further reduce the overall space requirement for the propulsion system. This freed up space can be utilized to carry more payload which would increase the potent power of the warship. Electrical Propulsion is an environment friendly technology which has been successfully used in the commercial ships with huge tonnage and the technology in this area, even though constantly evolving, guarantees the required stability and life-cycle support. This is in contrast to the difficulties envisaged in the life cycle support of mechanical drive systems as most of its manufacturers have reduced the production of their components due to the shift of commercial shipbuilding towards Electrical Propulsion. The transition of Naval platforms to IEP will not only grant the advantages listed above but also give the opportunity for warship builders to take the advantage of the phenomenal technological advancements in the larger commercial electrical power conversion industry. While the Electrical Propulsion technology offers many advantages, it also have some disadvantages like the high installation and near term costs, increased system complexity and less efficiency at full power. The past few years have been very important for the establishment of the IEP system in the naval environment. 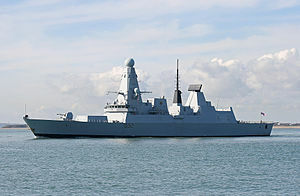 Over the years Electrical Propulsion has been successfully implemented in several naval platforms like the LPD and Auxiliary Oilers of Royal Navy and the LHDs of French Navy. A land based Electric Ship Test Demonstrator (ESTD) was set up by Alstom for UK and France to test the current, future and emerging electrical propulsion technologies there by de-risking the future naval IEP platforms. Many new researches are underway and the size of IEP equipments are expected to reduce significantly thereby offering strategic advantage of high power availability coupled with availability of more space onboard for combat systems. With the significant operational and tactical advantages offered by this technology compared to the very few disadvantages, IEP is definitely the future of Naval Power and Propulsion. This is precisely the reason why major naval powers like the United States and the United Kingdom have chosen the IEP technology for their future warship plans.